Many Americans over the past few years have been diagnosed with some form of arthritis. Arthritis means joint inflammation. A joint or multiple joints become inflamed and it puts the individual in a great deal of pain. There are different types of arthritis and all range in severity that may affect joints, tissue around the joints and even internal organs depending on which type of arthritis one has. According to the Arthritis Foundation, an estimation of over 50 million Americans are diagnosed with arthritis by their doctors. This number is only increasing as time goes on. Arthritis is not something to be taken lightly. It is not a disease that can be fixed by taking medication and then that’s the end. It is a disease that has to be watched and monitored. Arthritis causes many of our normal day to day movements to be impaired. For example, imagine that your wrist is constantly in pain, it is stiff and when you try to grab a cup of water the pain worsens and you are unable to really grab a good grip on the cup. This is an example of an individual who would have arthritis in their wrist. If you’re thinking, “no big deal, use your other hand to grab the cup” think about the hand that is trying to grab the cup is your writing hand as well. Imagine how much pain you would be in. This is only one example of the everyday motion that would be hindered as well as one form of arthritis. As mentioned above, there are hundreds of different types of arthritis that can occur anywhere. With the large number of Americans diagnosed with arthritis, researchers have been doing studies to learn more about what causes arthritis. According to the Arthritis Foundation, they know that arthritis is caused by elevated uric acid levels that wear down the cartilage in between bones. The cartilage is important for helping the bones not rub against each other. Risk factors that may cause arthritis are, old age, being overweight, certain occupations and joint injuries. Once an individual is diagnosed with arthritis they are given medication to help minimize and control the pain. 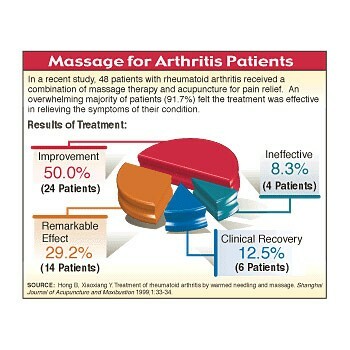 Researchers have found that when those with arthritis take the medication prescribed and get massages regularly they see an improvement in the range of motion, stiffness, stress levels and pain. The Arthritis Foundation explains that the type of massage and length do not matter. When getting a massage make sure to specify the areas that you want work on and the areas that need to be massaged with caution or avoided altogether. Communication is key to getting the best massage experience and also helping to improve arthritis pain. Stop by Happy Head to learn about the various massages and how we can help you combat the pain arthritis gives.